To raise mineral content/general hardness (GH) by 1 meq/L (3 dH), add 16 g (1 tablespoon) for every 80 L (20 US gallons) when setting up an aquarium or when making water changes (add to new water). For optimum solubility we recommend mixing with 1 L (1 qt.) of water (the resulting mixture will have a white opaque appearance). When this mixture is added to the aquarium it will impart a slight haze that should clear within 15–30 minutes. HINTS: Do not use Equilibrium™ when replacing evaporated water. This dose is based on DI or RO water; for other water, measure hardness (GH) first, then add according to need. For precise dosing, use the Seachem Digital Spoon Scale. Plant preferences vary, but a general guide is about 1–2 meq/L (3–6 dH) or match the existing or target carbonate hardness (KH), which, ideally, is also about 1–2 meq/L (3–6 dKH). Equilibrium™ will compact with age, but remains effective. Does Equilibrium™ introduce any chlorides or sulfates into the water? If so, at what concentration per molar weight? A: It does not introduce any chlorides. The balance from the Guaranteed Analysis is from sulfate and water of hydration. I can't go into any more detail w/o giving you the exact formula but that should give you a good approximation of what you need (i.e. knowing the rough percentage and the MW of sulfate you should get whatever number you are looking for). Is there a liquid equivalent to Equilibrium? A: As of now, there is no liquid version of Equilibrium, but you may want to try Replenish as an alternative. 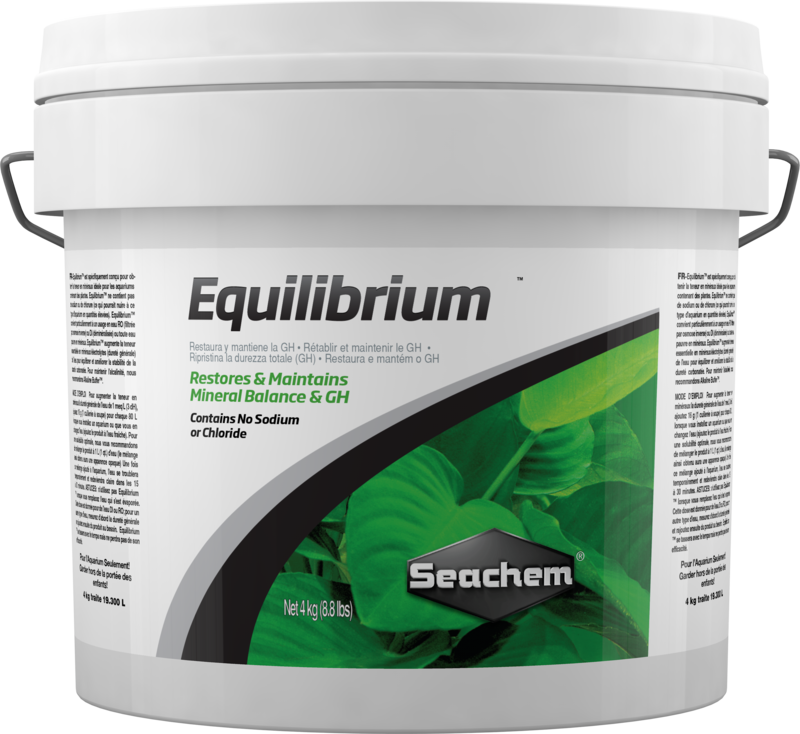 Does Equilibrium™ contain phosphates or anything else that might cause algae blooms? 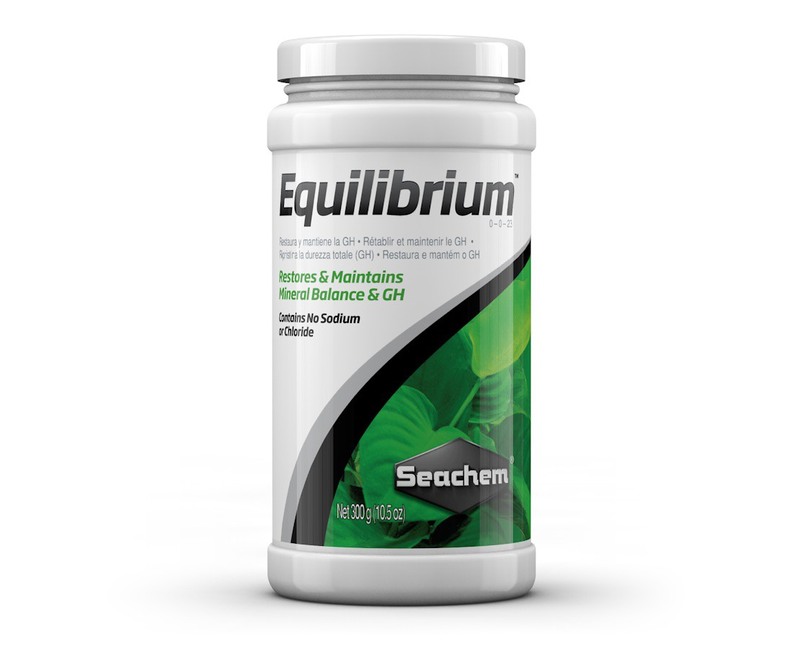 A: Equilibrium™ is a supplement designed to create or build general hardness (GH) due to its mineral content (calcium, magnesium, potassium, etc.). It does not contain any nitrogenous pollutants (ammonia, nitrite, or nitrate) and does not contain any phosphate. Elemental potassium is present at a concentration of 195,000 ppm (19.5%). Fertilizer laws require us to list potassium in terms of equivalence to a material that is not present (K2O) rather than the more scientifically sound method of simple elemental equivalence.